You’ve been busy this week! 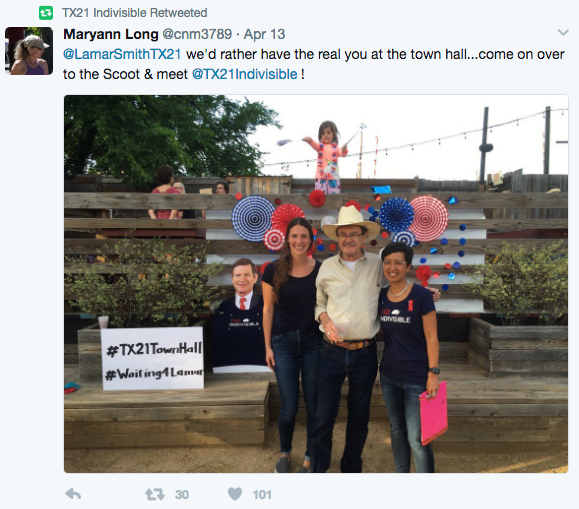 You’re showing up, making a difference, and people (even Rachel Maddow!) are taking note. Major victory alert: a member of Indivisible Gainesville changed Republican Rep. Ted Yoho’s mind on the release of Trump’s taxes. 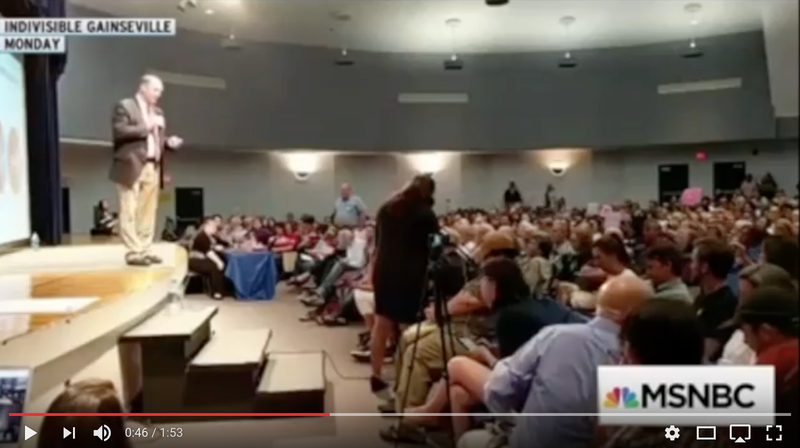 In Colorado, you went toe to toe with Rep. Mike Coffman on Medicaid and asked him to choose between you and Donald Trump. In New Jersey, you pressed Rep. Leonard Lance (again) to quit playing games with our health care and got a commitment from him that he would never support any attempt to repeal health reform that makes it harder or more expensive for people with preexisting conditions to get coverage. In South Carolina, you got The New York Times’ attention when you reminded Rep. Joe “You Lie” Wilson that life comes at you fast. In Pennsylvania, you stood up bravely and told Rep. Ryan Costello that without the Affordable Care Act, you would be dead. In Michigan, you got Rep. Justin Amash on record saying, “We should have worked with Democrats” to make the Affordable Care Act better. 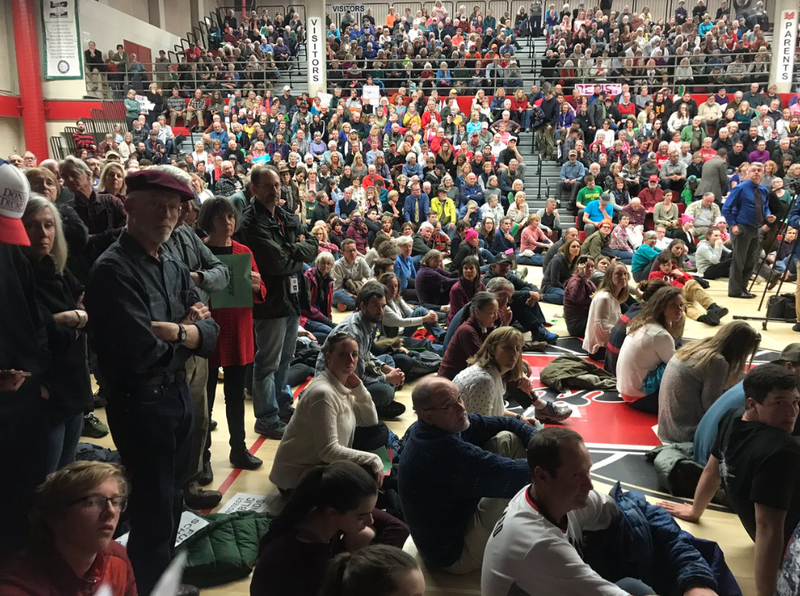 You (and 3,000 of your closest friends) really let Rep. Greg Walden have it again and again on his continued rubber-stamping of Trump’s dangerous agenda. In Arizona, you introduced Sen. Jeff Flake to the youngest member of Indivisible Surprise, 15-year-old Clucky the Flaky Chicken, asked all the tough questions from his support of Gorsuch to his position on an independent investigation of Trump’s ties to Russia, and wrote a new anthem to boot. Watch it. Trust us. 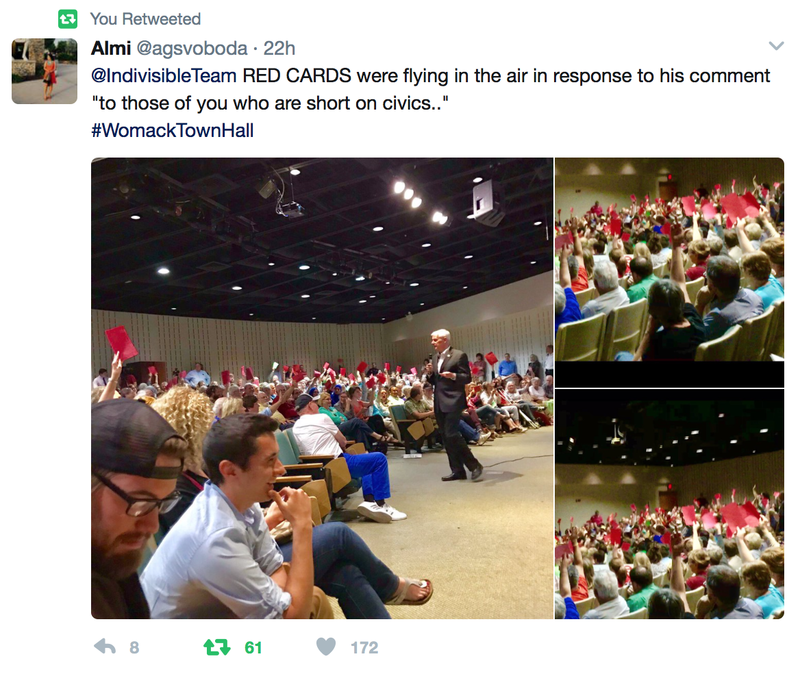 Then, down the street at Rep. Steve Womack’s town hall, you reminded a nation about the power of a simple red piece of paper to make your position clear. Then, if that wasn’t enough, when some members of Congress spent their week avoiding their constituents, you got to them anyway. And planned your own town hall. That’s just one week in—we’ve still got a whole second week to go of April recess, and plenty more opportunities for your group to stand indivisible. 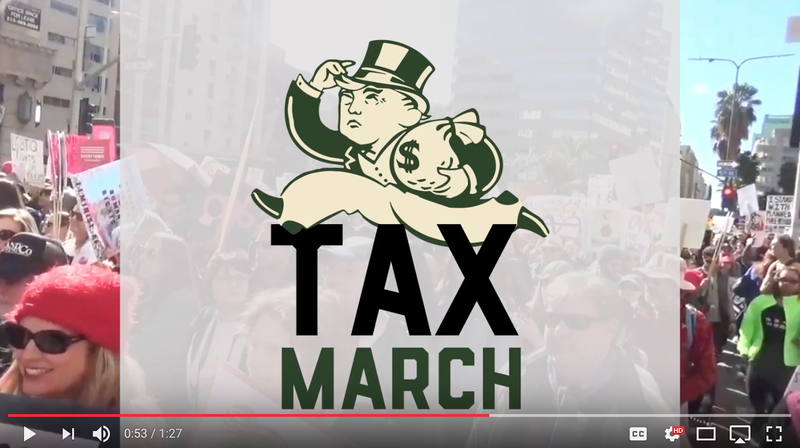 It’s April 15—Tax Day!—and that means it’s not too late to join up with our friends at Tax March, who are rallying in DC and in cities across the country today to demand Trump’s tax returns and find out just whose pockets he’s really in. But whether or not you’re marching today, you can make your voice heard by asking your MoC to demand Trump’s tax returns with our call script and town hall questions guide: How To Get Trump’s Tax Returns. New How-To of the Week! In this week’s new resource document, we provide tips on how to connect to, find common ground with, or persuade specific groups of people who may not agree with you or be convinced of the need to take action. Check it out: Organizing Is Mainly About Listening. Looking for even more insight on making those connections? 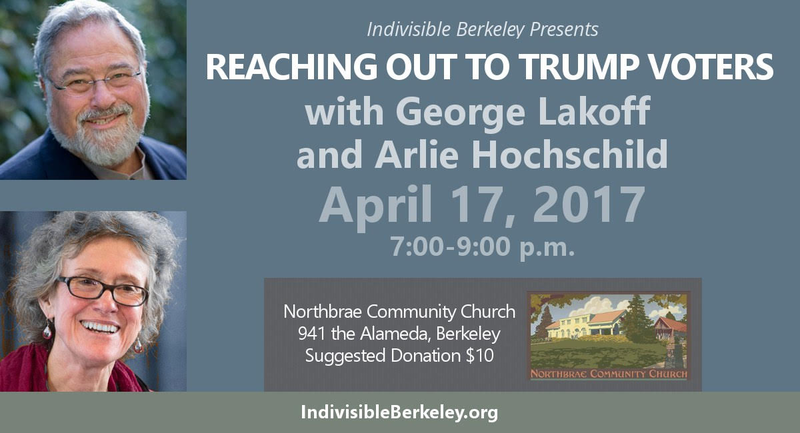 On Monday, April 17, at 10 p.m. EST/ 7 p.m. PST, we’ll join Indivisible Berkeley for an exciting Facebook livestream: Reaching Out To Trump Voters. Authors George Lakoff (Don’t Think of an Elephant) and Arlie Hochschild (Strangers in Their Own Land) will discuss their research and implications for how to have meaningful political conversations with people with different views. RSVP here to receive an email with a link to the livestream of this event. For the last few weeks, our friends at Resistance School have been sharing practical skills you can use to fight for progressive values. This week, legendary community organizer Marshall Ganz will lead an interactive session on building capacity and locally-based leadership teams. Get your group together and watch on Thursday, April 20, 7–8:30 p.m. EST on the Resistance School website and Facebook page. Find out more about this training session: How to Structure and Build Capacity for Action. Miss our Facebook live Q&A session this week? Ezra Levin, Leah Greenberg, and Angel Padilla took your latest questions on how to #ReclaimRecess. Catch up here. We also know that conversations about Syria are coming up in town halls, and maybe also in your local group. We believe in the importance of Congress exercising its constitutionally mandated responsibility to determine when and if the United States goes to war, and we have deep concerns that Trump will further escalate this conflict. We have a new explainer and town hall questions for asking your MoC to exercise oversight on Trump’s actions: Trump’s Dangerous Escalation in Syria.